Seven friends – P, Q, R, S, T, U and V have seated in a square table having 8 seats. Some of them are seated at the corner of the table while some of them have seated at the centre of the table. One seat is vacant. Some of them face towards the centre and some faces away from the centre. The friends are from different states viz. Jaipur, Rajasthan, Chennai, Pune, Punjab, Delhi and Hyderabad and have different hobbies viz. Singing, Reading, Dancing, Writing, Painting, Colouring and Cooking but not necessarily in the same order. The persons from Chennai and Jaipur sit together and U does not belong to any of these states. The one from Rajasthan sits second to the left of U who likes Reading. Q sits immediate left of R but does not sit on any of the corner. 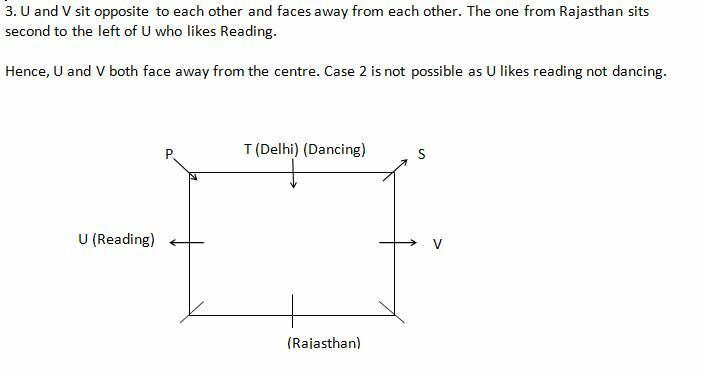 S faces the direction similar to that of V but opposite to that of P. R is from either Hyderabad or Punjab. The one who likes Singing sits immediate right of the one who likes Reading. Neither V nor P is from Chennai. 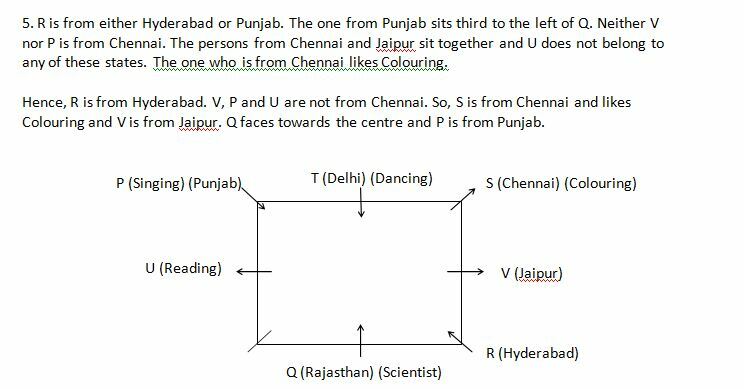 The one from Punjab sits third to the left of Q. U and V sit opposite to each other and faces away from each other. The one who is from Chennai likes Colouring. The one who likes Cooking sits fourth to the right of the one who likes Dancing. 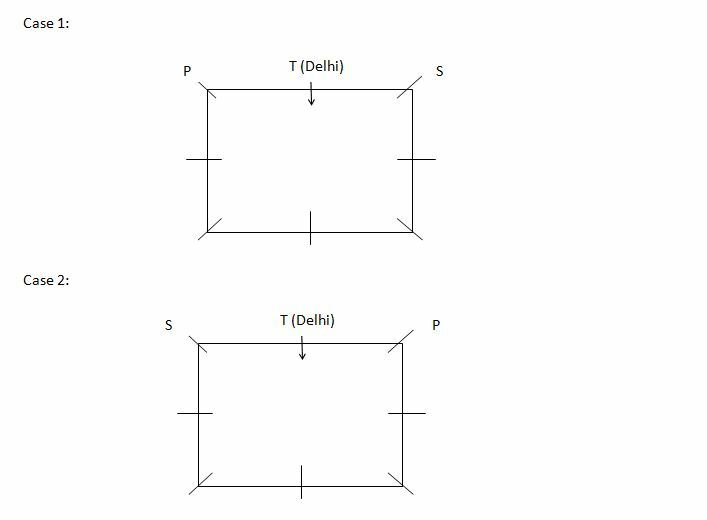 T is from Delhi and faces towards the centre and is the only one sitting between P and S on a side. The one who likes Dancing sits immediate left of S. V does not like Painting. The person from Punjab sits diagonally opposite to the one who likes painting. How many persons sit between T and V when counted anti-clockwise? 1. 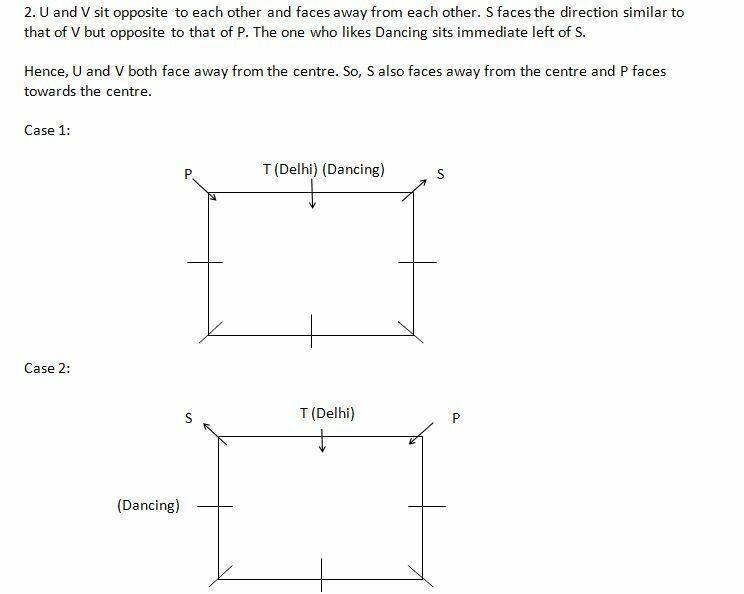 T is from Delhi and faces towards the centre and is the only one sitting between P and S on a side. S belongs to which state? How many friends face away from the centre? Who among the following likes Writing? (Direction 6 – 10): Eight members of a family of three generations are sitting around a circular table. 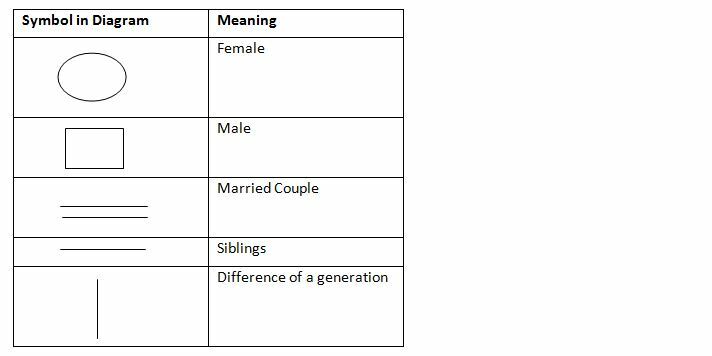 Each couple has at least one child and not all of them are facing towards the centre of the table. 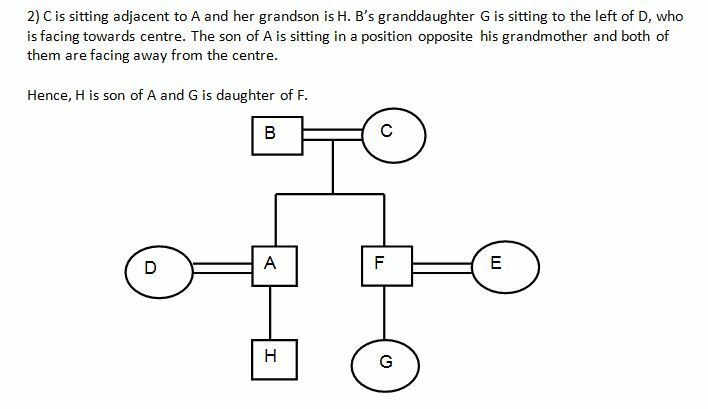 (i) A is the son of B whose daughter – in – law is E.
(ii) C is sitting adjacent to A and her grandson is H.
(iii) Members of each couple are sitting adjacent to each other and both of them are facing towards the centre or facing away from the centre. (iv) B’s granddaughter G is sitting to the left of D, who is facing towards centre. 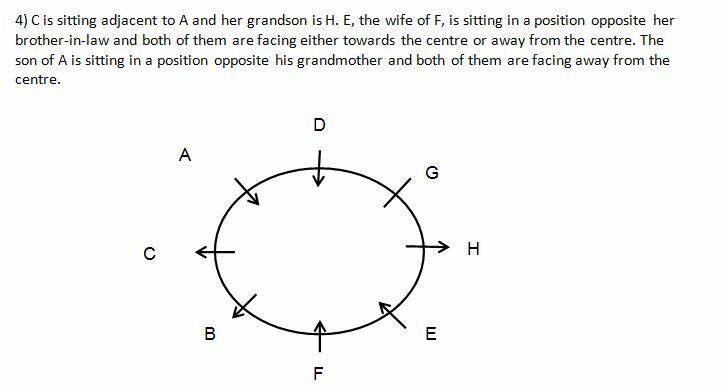 (v) E, the wife of F, is sitting in a position opposite her brother-in-law and both of them are facing either towards the centre or away from the centre. (vi) The son of A is sitting in a position opposite his grandmother and both of them are facing away from the centre. Who is sitting between E and B? How many of them are facing the centre of the table? Who is sitting to the left of C? Who among the following is sitting opposite to B?